" Was absolutely fantastic. The food was beautiful friendly staff and the boat is great not over crowded. Was a really great experience all round. Have been on the boat many times and will continue to cruise with you. Thanks for making Australia Day that bit more special "
" Very professional & friendly crew and just the right way to celebrate Australia Day! " " Found cruise by recommended by our family friend and was very happy with the best dinner cruise experienced so far on the harbour. Thank you "
" We had a great time on the Australia Day cruise, the boat was lovely and not over crowded. There was plenty of beer and wine and the food was nice and very fresh. I only have one small criticism which is that I found that the lining up for food was quite un organised. I think it would be nicer if one table at a time went and got there food. Other than that it was a wonderful cruise." " An exceptional experience and great food, wine and service. Highly recommended, thank you." " Fantastic night, will recommend to anyone. Thanks and well done. " " Had a great time, would definitely do this again. Moaring under the harbour bridge to watch the fireworks was the highlight. " " Had a wonderful night aboard the Magistic vessel; table service was phenomenal and the lay out of the seating wasn't too squishy or overcrowded. All waiters were exceptionally professional and views amazing. Food was delicious and constantly topped up, cannot fault the night or recommend highly enough. " " Thank you... no loud music, no glaring lights... loved it!!! It was professional and classy. Just what we wanted. We will be back . " " Brilliant trip, excellent staff who worked very hard. The guys waiting on the table were excellent. Skipper was great to, found an ideal spot for the fireworks. Absolutely brilliant all ways around, if we are ever here on Australia Day again we will definitely take the same trip with you guys again. A stunning and unforgettable trip! " The Australian Cruise Group traces its history in cruise management back to 1987. 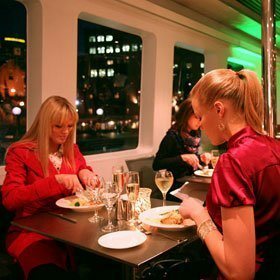 We have gathered significant insights from this long and proud experience, which allows us to offer economically priced, world class Sydney Harbour dinner cruise packages on the Parramatta River. 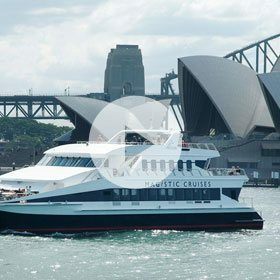 Magistic Cruises is owned and operated by the Australian Cruise Group management.Our luxurious Australian-built catamaran meets the strictest cruise demands from guests all over the world. 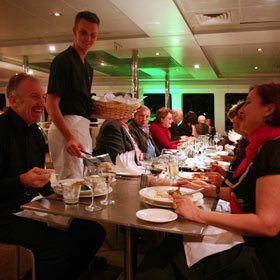 The 3 hour deluxe Sydney Harbour dinner cruise includes a tour of the Sydney Harbour, with the guests enjoying a gourmet buffet at just $88. 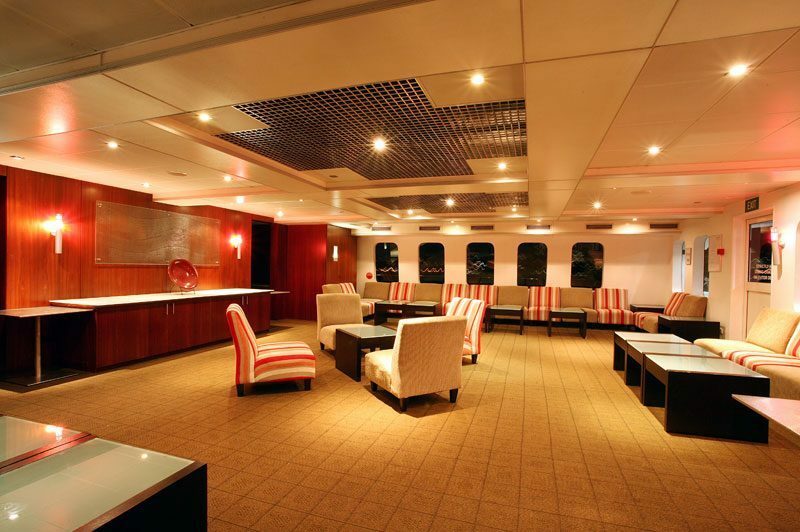 The Sydney dinner cruise is built to international standards in design and contemporary decor. 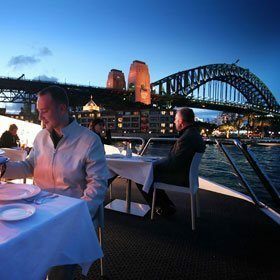 Magistic's luxury Sydney Harbour dinner cruise offers restaurant style seating with reserved tables, thus creating an ambience that rivals any high-end waterfront restaurant in the Sydney Harbour. The delicious buffet dinner is prepared by expert chefs who are skilled in multi-cuisine menus. The buffet selection includes fresh seafood, choice of hot and cold dishes, rich salads and decadent desserts. Our Sydney Harbour dinner cruise features a well-stocked, licensed bar onboard, where you can choose from a long list of beverages. 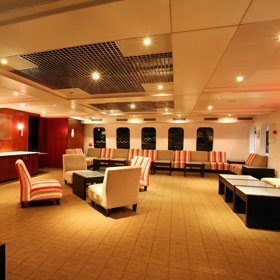 The beverages package is optional and comes with an additional $30 for the duration of the dinner cruise. You may even opt for your own exclusive brands from the bar. 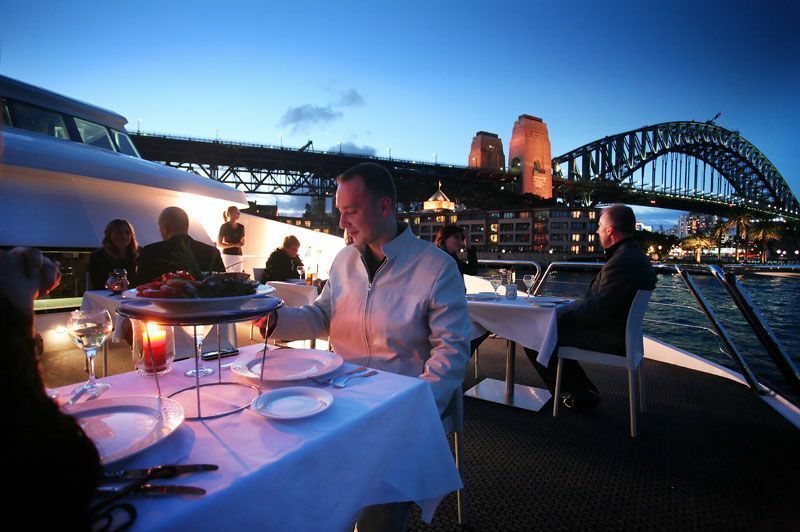 The 3 spacious outer decks of our Sydney Harbour dinner cruises are just right for a leisurely stroll with splendid photo opportunities to capture the dazzling Sydney skyline and surrounding attractions. We take a tour of the Sydney Harbour providing uninterrupted views of all the signature landmarks in and around the harbour. The celebrated Sydney Opera House, Harbour Bridge, Darling Harbour, King Street Wharf, The Rocks, Fort Denison, and Taronga Zoo are some of the prominent landmarks that you need to keep an eye out for. The spectacular views from our open decks will definitely tempt you to make another trip back to Sydney. 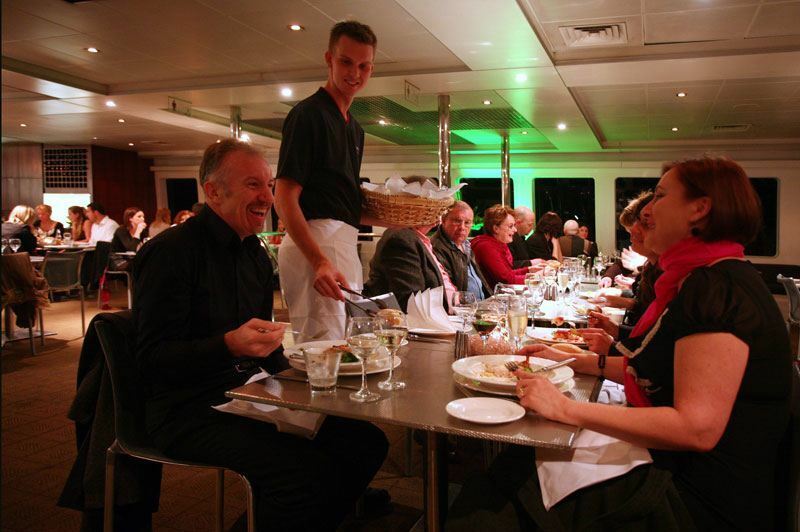 Our guests often come back for the dinner cruise, the best-value Sydney Harbour cruises. Magistic Cruises has multiple cruise options that are custom-made for cruise-lovers. We have our finger on the pulse of the cruising industry and our rich experience gives us an insight into the different demands of our guests. 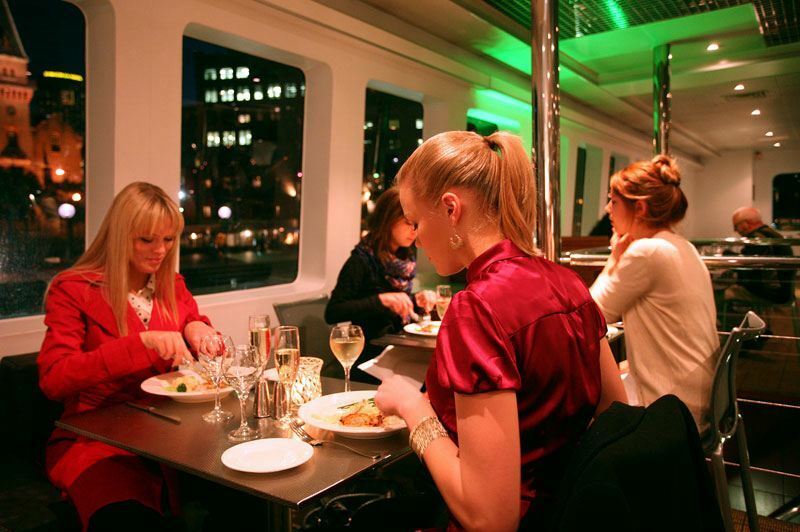 Whatever be the event or occasion, family get-together, business dinner, corporate party or private deck; we assure you quality Sydney Harbour dinner cruise with all the modern amenities aboard our climate-controlled catamaran.